Officially, it has now been the longest span of time between Friday the 13th movies. The last one to be released was the 2009 remake by Platinum Dunes, which means we're coming up on a decade without seeing Jason Voorhees on the big screen. Unfortunately, the future of the franchise remains uncertain, due to some legal drama going on over the rights. With it potentially being years before we get another official movie, filmmakers are taking it upon themselves to keep Jason alive in the meantime. 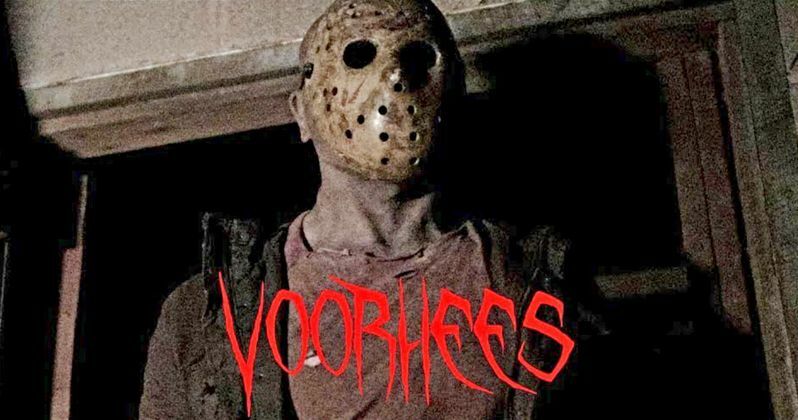 The next one to keep an eye on is Voorhees, which just released a full trailer this week. From director Cody Faulk and executive producer Chris Plaushin, Voorhees began as a successfully crowdfunded short film. Upon shooting, it was realized that there was still so much more of the story left to tell, that the filmmakers launched another campaign to make the movie feature length. This campaign was a success as well, as there are many Friday the 13th fans out there willing to spend money to see Jason killing people again. As a fan film, the movie will be free to watch when it's released online in the spring of 2019. One of the biggest selling points for Voorhees is that it's being hyped as the most brutal Friday the 13th movie yet, using all practical effects with zero CGI. In the movie, Jason is given a new selection of victims to play with. Rather than the typical teenage camp counselors he's used to hacking up, he'll be dealing with a crew of dangerous criminals. After pulling off a heist near Crystal Lake, the group kidnaps two women and seeks refuge in the long-abandoned campground. Of course, Jason finds them there, and starts picking them off in horribly violent ways. With some of these victims, fans may actually be rooting for Jason. But he will show mercy to the two women who've been taken captive? Knowing Jason's history, probably not. This movie is one of several to help satiate Friday the 13th fans waiting for a big screen return for the franchise. Fan favorite actress Deborah Voorhees, who has a memorable role in the fifth movie, is writing and directing an intriguing meta-film called 13 Fanboy. It features many stars of the series playing themselves, targeted by an obsessive horror fan intent on murdering them. So far, some great talent has been confirmed to appear, including Kane Hodder, Judie Aronson, Tracie Savage, C.J. Graham, Thom Mathews, Ron Sloan, and Carol Locatell. This movie is currently raising its budget on Indiegogo and even more names are expected to be announced soon. We are all eager to see Jason Voorhees back in theaters one day and there's no doubt about that. Reportedly, LeBron James is looking to reboot the series officially with an all new Friday the 13th movie. However, there've been no updates on this since then, likely due to the issues concerning the rights. For now, the spirit of Jason will be kept alive in fan films like Voorhees. The movie stars It will be released in the spring of 2019, and you can watch the full trailer from Wet Paint Pictures.